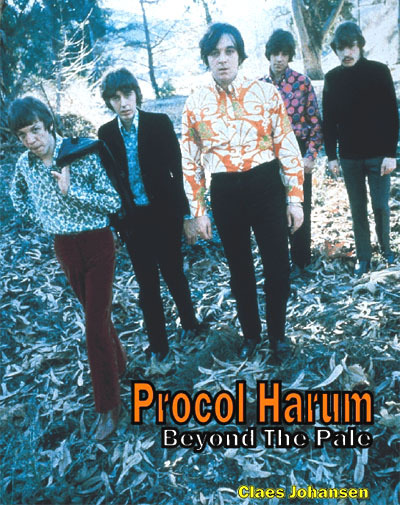 Given the enormous number of rock biographies that seem to be produced, it is rather surprising that it's taken this long for a work devoted to the career of Procol Harum. But here at last is a knowledgeable account of the band's career and music. We get about 160 pages on the various stages of the band's career, along with a discography which includes all the solo material by band members; there are eight pages of black-and-white pictures, most of which I, at least, hadn't seen before; and an index, which, however, only has names of people and bands and doesn't include references to albums and individual songs. One thing to be said about this book straight away is that it is obviously based on an enormous number of interviews with the band over a long stretch of time, so there's a lot of first-hand information here which has not previously seen the light of day - this is not just a compilation of old press clippings. According to the introduction, however, Brooker and Reid have refused more recently to give interviews to help the book towards completion, though it's difficult to see why they should want to be so reticent. And the author seems to have got hold of most of the main players and gives everyone their due - it would have been all too easy to concentrate on Brooker. If anything, I think, the author is perhaps too careful not to tread on anyone's toes. The thorny question of Matthew Fisher's claim to a share of the composing credits on AWSoP is not really fully explored, as would have befitted one of the major controversies of the band's career, the death of BJ will seem quite mysterious as it's presented here, and I couldn't help feeling the author was being deliberately reticent about Keith Reid's background. But on the other hand, it's good to read a book on a rock band that concentrates more on the music than on the private lives of its members. It's also nice to read a book that actually has something to say about the music. Most writers are so much more at home analysing lyrics than pieces of music, that they talk about the words, the production, anything but the music itself. But as a musician, Claes Johansen is able to give the music its due and he gives a good account of the musical side of the band's development. Inevitably, this account is skewed towards the early days of the band: the very early days about which most of us know little; the first success when PH were making their greatest strides towards a distinctive niche in Rock. The detailed analysis of the repertoire of the Paramounts is very welcome and places them very squarely in the British R&B boom of the early sixties, a quite different area from that to be occupied by PH. Also the coming-together of the personnel and the various musical strands both in the Paramounts and on the early albums is well covered, as are the managerial and other problems that damaged their career after AWSoP. However, CJ does seem to lose interest a bit when it comes to the later records - he has hardly anything to say about Grand Hotel, for example, and even less about Procol's Ninth. Of course, these were musically less ground-breaking than Procol Harum, but I couldn't help feeling they get short shrift. A mere fifteen pages on the period of the post-Edmonton albums is too little. On the other hand, one area he covers very well throughout is the particular strengths of the individual musicians and what they brought to the band. The final phase of the band's career is dealt with a series of short sections on Brooker, Trower, Fisher, and "others", and ends with a section on the Redhill reunion, though there is no mention of the Barbican concert. Personally, I'd have been very happy if the book had been 50 pages longer, and it's tantalising to wonder what other material Claes Johansen has collected over the years that has not seen the light of day here. Still, that doesn't change the fact that this is a splendid book - it's an excellent account of where Procol Harum came from; it tells you everyone who was in the band and when; and you get a real idea of what made them unique and how that was achieved. I can't imagine there's any visitor to this Website who wouldn't think it's worth buying.